CalTrend, The Seat Cover Specialists For over 25 years, CalTrend has been driven to delivering the best in class craftsmanship, superior design, and industry leading technology in manufacturing custom car seat covers. No one comes close to their premium quality, lead times, and product value because no one does car seat covers like CalTrend. CalTrend designs, manufactures, tests, and ships in the USA from start to finish, enabling them to deliver the fastest turnaround in the custom car seat cover industry. This is their sole passion and expertise. As the industry leader in custom car seat covers, they exclusively manufacture car seat covers, so you can be confident that their experience and quality are second to none. What Sets Caltrend Apart. 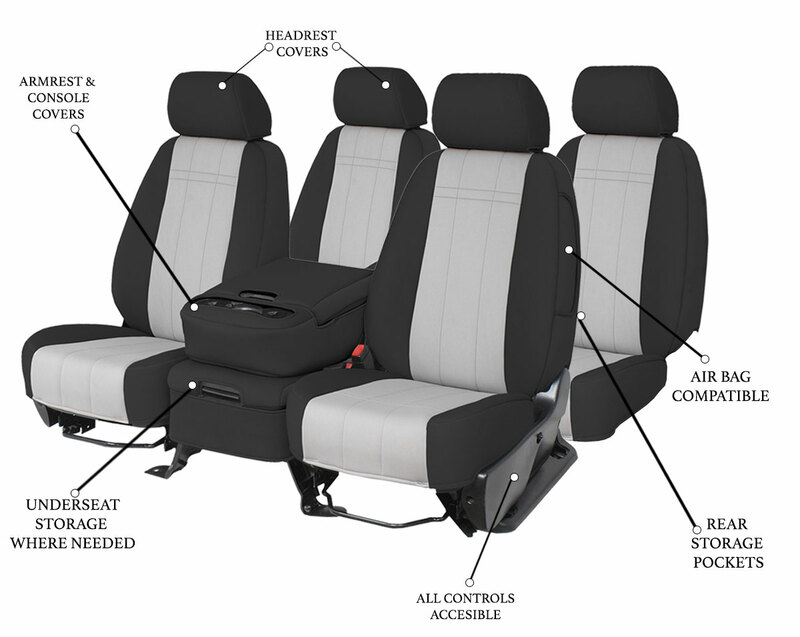 USA made products are manufactured in California with premium grade, genuine automotive fabrics and materials. Top quality engineering ensures a perfect fit, every time. Premium grade fabrics and materials. Easy installation that slips over the original upholstery. Sole focus is making the best custom car seat covers: this is what they do, this is all they do. Closely knit team members collaborate toward the realization of their passion – and benefit in our shared success. CalTrend has been the leading experts in designing and manufacturing custom tailored seat covers for over 25 years in the USA. Being a privately-owned company, they are able to respond quickly to our customers needs. They invest heavily in R&D to constantly improve product quality and service. Their sophisticated state of the art CAD/CAM systems design custom seat covers that are manufactured specifically for your vehicle, and they are developing new designs and styles everyday. They offer a vast selection of materials and fabrics in popular colors such as neoprene, neosupreme, leather, duraplus, carbon fiber as well as various camouflage prints. Hheadquartered in sunny Southern California just minutes from the beaches, making CalTrend your # 1 custom car seat cover choice with the fastest turnaround in the industry.